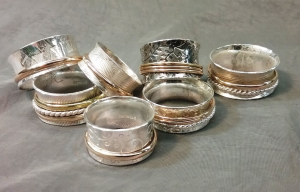 The focus of this class will be learning to make different kinds of rings. We will be making spinner rings, rings with cabochons and stack rings. Students will learn how to determine the size needed to make a ring a specific size. They will also use texturing techniques and other embellishments such as pure silver beads to make their rings unique. They will learn to bezel set stones for a ring and also how use prongs to make a gemstone ring. Students will continue to improve their understanding of the soldering process and their skills at soldering and finishing a ring.